As soon as the arena doors open our bars and food outlets are waiting with freshly cooked dishes to enjoy and keep you fueled throughout your night! From burgers to mexican... There's plenty of great food to choose from at the Food Express outlets. From sustainably caught fish and British chips to delicious burgers, and from zesty Old El Paso fajitas to confectionery, we've got something for everyone. And to make things even quicker you can pay with contactless payment. There's a selection of bars serving alcoholic, soft and hot drinks. Grab and go at the Amstel Bar or sit down and relax in the all new Explorer Bar by Schweppes. Head into the main arena where you will find two more large bars serving drinks and snacks. Our caterer, Amadeus not only believe in providing great food, but hold the belief that we are accountable in providing sustainable solutions for the venues and clients we work with. You can view Amadeus' Catering Sustainability Statement here. INTRODUCING, THE EXPLORER BAR BY SCHWEPPES! X marks the spot... Come and discover a new world of pre-show bars at Resorts World Arena! This contemporary bar (which you'll be pleased to hear is open to everyone), has exploration at its very heart. The steam-puck aesthetic will take fans back in time to a time of discovery before the show and gives a great atmosphere to relax before heading into the arena bowl. 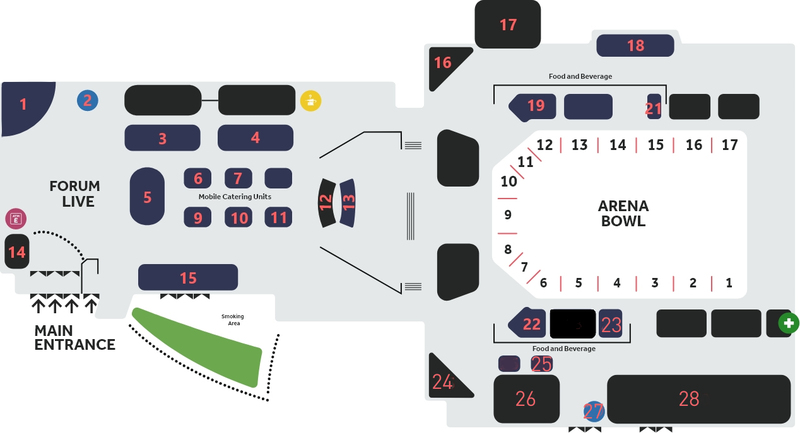 Use our interactive map below to find out more about the food, drink, merch and more that we have on offer within Forum Live and around the concourse at Resorts World Arena! Pints, spirits and bottles served up at this bar. Why not beat the queues and pre-order your drinks from the Amstel Bar with QJacker? Visit uk.qjacker.com, then collect them at a time convenient for you! Parking payment machines are located inside Resorts World Arena, outside the Box Office or within the NEC. You can also pay for your parking online using your mobile phone here. Those parked in a Resorts World Birmingham car park, who received a ticket upon entry to the car park, will need to pay within Resorts World opposite the Arena. Chinese takeaway anyone? Hot Wok offers a tasty alternative, served in takeaway pots there is a Chinese spiced chicken and a vegetarian option of dumplings to enjoy. All are served with noodles and stir fry vegetables. Ask for Vegan options. Hard to beat a burger and chips to start off your night. Delicious beef burgers with all the trimmings in a fresh brioche bun or try our spiced chicken burger or our vegetarian falafel burger. Ask for Vegan options. Resorts World Arena is keen to give back to the industry and provides local and unsigned talent with the opportunity to perform in Forum Live before headline acts take to the main stage. Check it out on your next visit to us! This pod serves up fresh tea & coffee along with a selection of freshly prepared deli sandwiches. Bottle bar serves up a selection of bottled beer, cider wine, cocktails & Fizz. Soft drinks and sweets are also available from this kiosk. Sweet Tooth? Pick up a bag of sweets and a drink at our Sugar Rush hut! Sweet Tooth? Pick up a bag of popcorn, sweets, Ice cream and a drink at our Sugar Rush hut! Resorts World Arena has more merchandise than you can shake a stick (with your favourite artist on) at. From programmes to t-shirts, glow-sticks to replica wrestling belts, we've always got merchandise to help you remember the night. The coke bar serves up bottle beer, cider, wine & spirits alongside your favourite soft drinks. Small selection of deli sandwiches and snacks are also available. The box office at Resorts World Arena is located next to the main entrance. Head here for ticket collection and for any ticketing queries. Soak up the atmosphere in forum live and enjoy a generous slice of freshly baked pizza to get you going for the show. Classic Margarita and pepperoni pizzas are available. COMING SOON look out for a new exciting bar opening for start of February in our Westside Lounge. Stowford Press Cider combines century-old traditions with a flavour designed to appeal to more modern tastes. The Stowford Press Bar serves up pints and bottles of this delicious cider as well as a wide selection of lager, wines, spirits and soft drinks. This bar serves up spirits, draught & bottle beer and cider, wine alongside a selection of soft drinks. Snacks include our delicious churros, but you need to get in early before they sell out! This funky little Mexican themed bar serves up pints alongside bottled beer, cider and wine as well as a selection of cocktails and tequila. It’s fizz o’clock!!!! Treat you and your friends to some prosecco to celebrate the show. With pink prosecco, tasty flavour toppings – this is the place to come to make your night go with a pop! In a rush? Then grab some tasty tortilla chips covered in a selection of toppings, from BBQ pulled pork, beef chilli, Quorn & bean chilli to take to your seat. Like it hot? Try our hot cheese sauce with jalapenos. A number of male and female toilets are located within Forum Live and around the concourse of the arena bowl. Experience events in ultimate luxury with access to Amplify's premium Air Restaurant at the Resorts World Arena. Pints, spirits and bottles served up at this bar. Resorts World Arena has 10 public, stand-alone, unisex accessible toilets for our disabled visitors. In addition to the accessible toilet provision, Resorts World Arena can also boast a Changing Places toilet facility which can be found at the rear of Block 12. A free to use ATM machine is located within Forum Live. Did you know all our food and beverage kiosks take card payment as part of our Cashless initiative? Find out more in our FAQs. Amstel Bar Pints, spirits and bottles served up at this bar. Why not beat the queues and pre-order your drinks from the Amstel Bar with QJacker? Visit uk.qjacker.com, then collect them at a time convenient for you! Parking Payment Machine Parking payment machines are located inside Resorts World Arena, outside the Box Office or within the NEC. You can also pay for your parking online using your mobile phone here. Those parked in a Resorts World Birmingham car park, who received a ticket upon entry to the car park, will need to pay within Resorts World opposite the Arena. Hot Wok Chinese takeaway anyone? Hot Wok offers a tasty alternative, served in takeaway pots there is a Chinese spiced chicken and a vegetarian option of dumplings to enjoy. All are served with noodles and stir fry vegetables. Ask for Vegan options. Burger Kitchen Hard to beat a burger and chips to start off your night. Delicious beef burgers with all the trimmings in a fresh brioche bun or try our spiced chicken burger or our vegetarian falafel burger. Ask for Vegan options. Amstel Stage Resorts World Arena is keen to give back to the industry and provides local and unsigned talent with the opportunity to perform in Forum Live before headline acts take to the main stage. Check it out on your next visit to us! MADE This pod serves up fresh tea & coffee along with a selection of freshly prepared deli sandwiches. Bottle Bar Bottle bar serves up a selection of bottled beer, cider wine, cocktails & Fizz. Soft drinks and sweets are also available from this kiosk. Sugar Rush Sweet Tooth? Pick up a bag of sweets and a drink at our Sugar Rush hut! Sugar Rush Sweet Tooth? Pick up a bag of popcorn, sweets, Ice cream and a drink at our Sugar Rush hut! Merchandise Unit 1 Resorts World Arena has more merchandise than you can shake a stick (with your favourite artist on) at. From programmes to t-shirts, glow-sticks to replica wrestling belts, we've always got merchandise to help you remember the night. Coca Cola Bar The coke bar serves up bottle beer, cider, wine & spirits alongside your favourite soft drinks. Small selection of deli sandwiches and snacks are also available. Box Office The box office at Resorts World Arena is located next to the main entrance. Head here for ticket collection and for any ticketing queries. Neos Pizza Soak up the atmosphere in forum live and enjoy a generous slice of freshly baked pizza to get you going for the show. Classic Margarita and pepperoni pizzas are available. Merchandise Unit 2 Resorts World Arena has more merchandise than you can shake a stick (with your favourite artist on) at. From programmes to t-shirts, glow-sticks to replica wrestling belts, we've always got merchandise to help you remember the night. Westside Bar COMING SOON look out for a new exciting bar opening for start of February in our Westside Lounge. Stowford Press Bar Stowford Press Cider combines century-old traditions with a flavour designed to appeal to more modern tastes. The Stowford Press Bar serves up pints and bottles of this delicious cider as well as a wide selection of lager, wines, spirits and soft drinks. Electric Avenue This bar serves up spirits, draught & bottle beer and cider, wine alongside a selection of soft drinks. Snacks include our delicious churros, but you need to get in early before they sell out! Barra This funky little Mexican themed bar serves up pints alongside bottled beer, cider and wine as well as a selection of cocktails and tequila. Sparkles It’s fizz o’clock!!!! Treat you and your friends to some prosecco to celebrate the show. With pink prosecco, tasty flavour toppings – this is the place to come to make your night go with a pop! Nacho Bar In a rush? Then grab some tasty tortilla chips covered in a selection of toppings, from BBQ pulled pork, beef chilli, Quorn & bean chilli to take to your seat. Like it hot? Try our hot cheese sauce with jalapenos. Merchandise Unit 3 Resorts World Arena has more merchandise than you can shake a stick (with your favourite artist on) at. From programmes to t-shirts, glow-sticks to replica wrestling belts, we've always got merchandise to help you remember the night. Toilets A number of male and female toilets are located within Forum Live and around the concourse of the arena bowl. Air Restaurant Experience events in ultimate luxury with access to Amplify's premium Air Restaurant at the Resorts World Arena. Lakeside bar Pints, spirits and bottles served up at this bar. Accessible Toilets Resorts World Arena has 10 public, stand-alone, unisex accessible toilets for our disabled visitors. In addition to the accessible toilet provision, Resorts World Arena can also boast a Changing Places toilet facility which can be found at the rear of Block 12. Cash Machine A free to use ATM machine is located within Forum Live. Did you know all our food and beverage kiosks take card payment as part of our Cashless initiative? Find out more in our FAQs.